Fall officially began last week, so it's time again to share some trends for the season. Last week we were at a trunk show surrounded by sweaters and it was hard to even think about wearing them with 80 degree weather outside! But, if you don't buy things now, many of the items will sell out because designers are not cutting as many pieces as they once did. So, to help you with your fall shopping list, here are some of the trends to watch. This is just an extension of all the statement sleeves from spring (which are still big). For fall, designers showed this look in sweaters. This Demylee sweater is prefect with the fun ruffle detail on the shoulders as well as the prefect yellow color. Bonus: designers showed yellow for spring 2018, so you know this color will be around for a while. Velvet is the hot fabric for fall! Designers are showing it in tops, pants, purses and shoes, and everything else! So, it's super easy to add this fabric to your closet because you have lots of options. 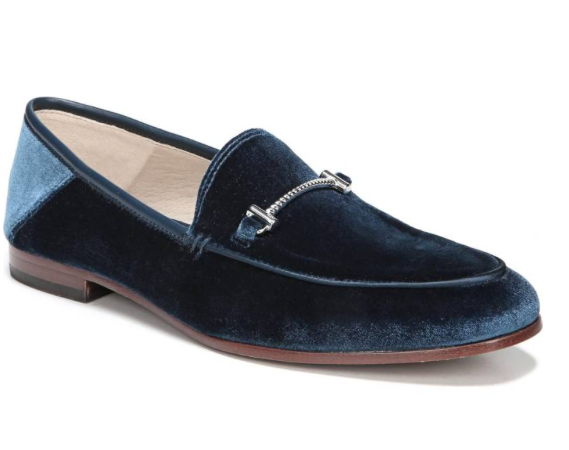 We love these loafers by Sam Edelman . Red is reigning supreme this fall! Not just one shade of red, but all different hues, which is great because it can work on lots of different people. In the right shade, like a burgundy or wine, red can even be considered a neutral. Designers paired red with pink (gasp! ), and we love this fresh look! Here's a Halogen ruffle sweater paired with a pair of Halogen wide leg crop pants. Excellent value on this outfit! Bows are everywhere. Some people may think this look is too fussy, but you can still try it without looking too sweet or girly, if that isn't your vibe. We picked this dress by Keepsake because it is sophisticated with one shoulder and pleating detail. We know it looks a little short, but the model is 5'9", so for many of us it wouldn't be as short. This is a great trend because it's nice to be able to mix-up denim and give it a little different look. Designers have added embroidery and trim to jeans. This pair by Mother Denim is great because it's an ankle jean, which is the prefect length because it can be worn with most types of shoes. It has the high-low detail as well as the fringe. Different enough to get noticed, but still practical enough to wear with anything. It's possible this trend has been on our blog as a trend for the last few fall seasons. So is it really a trend? Fur is here to stay! Fur vest, coats, fur trimmed sweaters, those are are still on trend. This season, designers branched out and added fur detail to shoes. What's not to love about that? Here is a great neutral sneaker from Rachel Zoe. We think you'll where this show all season long. So those are just a few of the many fall trends out there. In the coming weeks we are going to share what's on our personal shopping lists for fall. Happy Shopping!